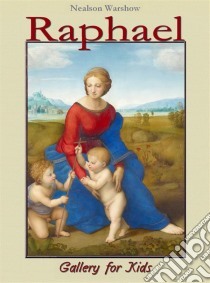 Raffaello Sanzio was an Italian Renaissance painter, architect and designer. His work along with that of his older contemporaries Leonardo and Michelangelo defined the High Renaissance style in central Italy. He was a popular personality, famous, wealthy, and honoured and his influence was widely spread even during his own lifetime. His posthumous reputation was even greater, for until the later 19th century he was regarded by almost all critics as the greatest painter who had ever lived — the artist who expressed the basic doctrines of the Christian Church through figures that have a physical beauty worthy of the antique. He became the ideal of all academies (it was against his authority that the Pre-Raphaelites revolted), and today we approach him through a long tradition in which Raphaelesque forms and motifs have been used with a steady diminution of their values. He has been a major inspiration to great classical painters such as Annibale Carracci, Poussin, and Ingres. It is never too early to introduce kids to art through books and museum visits, but parents often fear that kids will be bored. Parents can make art trip successful by giving kids spending a lot of time with few artworks instead of trying to see a lot. The books of Gallery for Kids series were written on a plain language and will be of interest to all ages. The books will help kids become more familiar with and learn to be pleased about the works of prominent artists. Dear parents, in these books you will find interesting facts about artist's life, and his annotated most famous masterpieces; in addition in each book there is a fun activities wit coloring pages. Don't miss the opportunity to discover the joy of art learning alongside your little one.